CityGrips Small Single Bar fit strollers & prams that have one single handlebar. They fit perfectly over stroller with a break system in the center. CityGrips Small Single Bar measure 5.5 inches or 13cm long and come in a pack of 2. A. CityGrips Small Single bar fit over almost 90% of strollers. Click here to get a full list of strollers it will fit. These worked out great for us! I bought these specifically for a vacation to Disney for our Graco Aire3 Stroller. The handles have the foam type cushioning and I don’t like the feel against my hands so I purchased the City Grips for that reason. The City Grips are much smoother and were perfect. What was even better is that since these are bright pink when trying to locate our stroller among hundreds of other black strollers that all looked the same, all I had to do was glance at the handles and we were able to quickly find our stroller among all the others. Once I put these on, I’ve never taken them off and so they have stayed exactly where I placed them with no issues. this grip is simply amazing! i like the web design and the simple monotone color. perfect for mu stroller and it’s fun to match it with other stroller accessories. would love to buy more different designs for my other strollers. definitely would recommend it!! A mommy must have! It’s totally worth buying. Thank you for sending these so fast. I got them in time for our trip to Disney and everyone kept stopping us to ask where we got them. 🙂 They were a big hit! The foam part of my stroller ripped after gate checking it on the plane. I bought these to cover the handle, they are great, nice and soft. I wish they had more designs. Also adds some personality to an otherwise boring all black stroller. Love it! Protect my bugaboo handle really well! Love them to keep my stroller handle clean. I also hated the feel of the rubber from my City Mini, so these are perfect! I use these covers on my Britax stroller. The Britax comes with a non-removable foam covering on the handle bar so this a great way to preserve and protect it from hand sweat, odors and wear and tear. 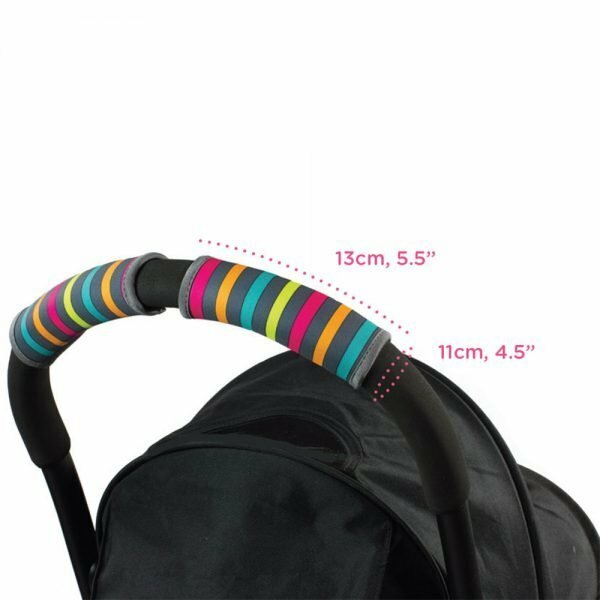 These blend in with the stroller and make the stroller grip more comfortable. Good for sweaty summers. I can just wash them and throw them back on the stroller. I love it, It makes my stroller more comfortable and really stylish. 🙂 Quality is also really good. If you love to have goodies to stroller this one is nice. I love this product! A very simple way to keep the handle bar clean. It fits both my Bob Motion and Britax B-Ready. Love the design and love that they’re washable! The cloth and valcro is of Gd quality. feels comfortable and looks gd on my new bugaboo. Will get more in different colours. Almost fits well. I do love the texture of this product, just wish it was slightly wider. My stroller handle bar is kind on wide and this fits only because I really stretched it. Got these grips for my Bob stroller-the orange color matches perfectly, and the neoprene material is very soft to touch and easy to clean. This will extend the life of my Bob’s handlebars. A must have for those who are a bit OCD like me, can wash as many times as you need and maintain the integrity/cleanliness of the handlebars! Win! We were given a used Bob stroller but the handlebar foam had ripped off. It seemed that these covers would be an easy fix, ANd, yes, these covers worked great. They wrap around snugly and are comfortable and nicely colored. I think they add a bit of flair to the stroller! Love these! I sold my Bugaboo Frog to buy a Baby Jogger City Select with second seat (for baby #2). The Bugaboo had a nice soft foam handle, but the City Select’s handle is rubber. My hands are very sensitive, and the rubber handles on the City Select were actually hurting me! These grip covers were the perfect solution!